Ruth Napaljarri Stewart has been exhibiting her artwork since 1986 throughout Australia and around the world. She's part of the Warlpiri Group and lives in Yuendumu in the Northen Territory. Her painting “Ngatijiri Jukurrpa” (“Green Budgerigar Dreaming”) tells the story of the Napaljarri women and the Japaljarri men and how they would hunt for the small bright green budgerigars, native to central Australia. This gorgeous painting with its colourful, intricate design, is fantastically featured on this fine porcelain Salt & Pepper Set from Alperstein. They're guaranteed to become a talking point at your next dinner function! And Alperstein isn't just about fine art from Australia's heritage. 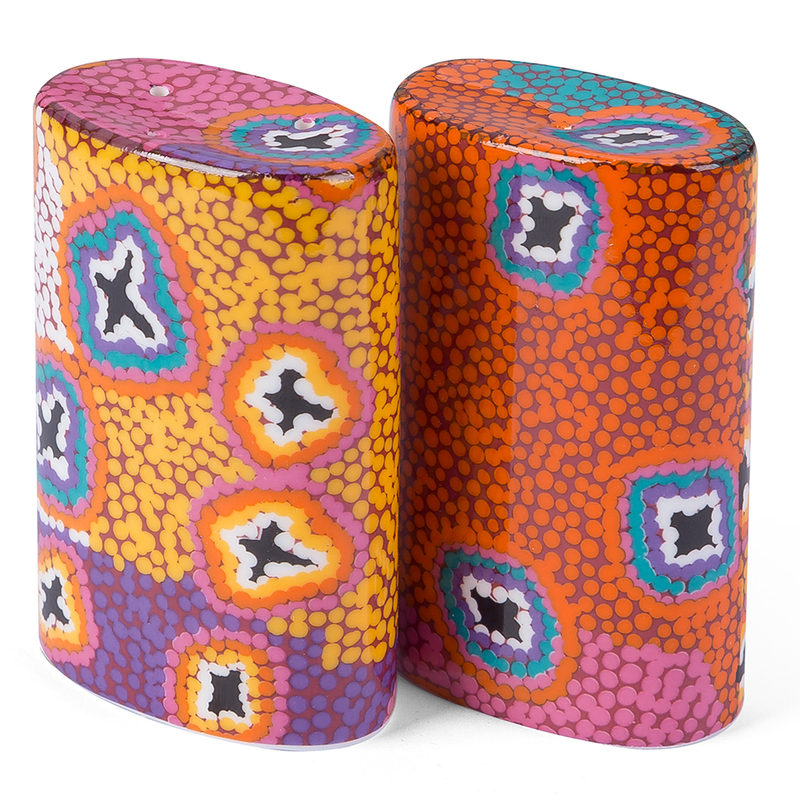 Together with Warlukurlangu Artists Aboriginal Corporation, they aim to directly benefit each artist and their community, with all royalties from the Aboriginal Art collection passed along to them. It's a powerful and ethical way to bring art to life. Rubber stoppers at base of shakers secure contents. Design: Ngatijiri Jukurrpa (“Green Budgerigar Dreaming”) by Ruth Napaljarri Stewart.